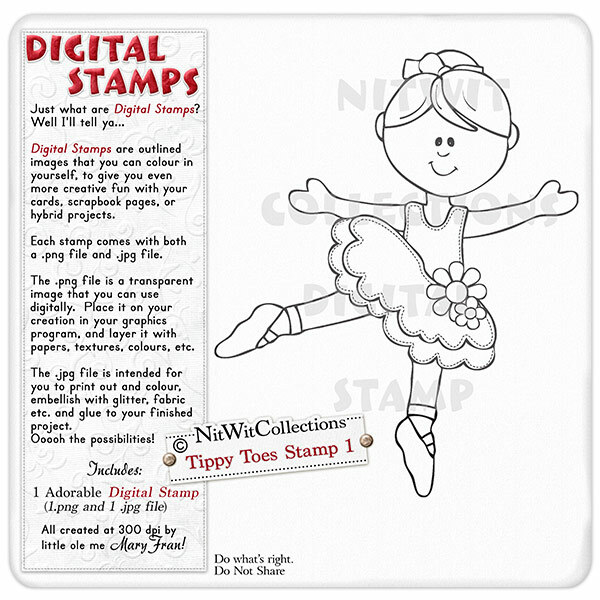 Tippy Toes Digital Stamp 1 is a beautifully posed ballerina ready for your ideas as to how she should look. Should she have blonde hair or brunette? What colour would her tutu be, and would you like to add a little sparkle or glitter to her? The choice is yours with this digital stamp. A great creative addition for your card making, scrapbooking, and hybrid scrapbooking projects. 1 Ballerina Stamp (2 files - 1 image is a .png file and 1 is a .jpg file format). Digital Stamps are not available for resale by any License holders.